An absorbing long read with terrific character development with the language and techniques of 19th century English novels and 20th century British mysteries. One of my favorite books from Audible. Fascinating multiple points of view while maintaining one time line without flashbacks and minimal foreshadowing. In 1999, Clark Elliott suffered a concussion when his car was rear-ended. Overnight his life changed from that of a rising professor with a research career in artificial intelligence to a humbled man struggling to get through a single day. At times he couldn't walk across a room, or even name his five children. Doctors told him he would never fully recover. After eight years, the cognitive demands of his job, and of being a single parent, finally became more than he could manage. If you could sum up The Ghost in My Brain in three words, what would they be? The melding of the narrator's voice with the written word. Arthur Morey became Clark Elliott in my mind with all of the empathy and restrained emotion required of such a devastating and dramatic story. Best of all, I had a great cathartic cry over the happy ending. As I say, Arthur Morey's voice became Clark Elliott for me, with just the right touch of restrained emotion to get the story of such devastating brain damage across to the listener without conveying the total misery Dr. Elliott was actually undergoing. Mr. Morey's voice sounds age appropriate for Dr. Elliott, and his voice is quite pleasant, soft and pleasing. The story of being lost around Lake Michigan and his return home to his family and the dog had me laughing out loud at the outrageousness of the situation and Clark Elliott's helplessness. 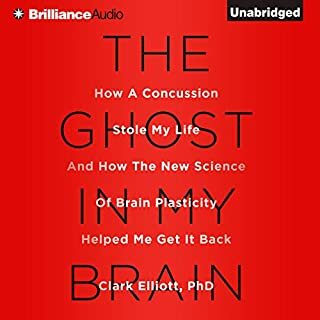 And it gets better: Dr. Elliott is constantly aware of the juxtaposition of his helplessness and his sophisticated knowledge and understanding of exactly what is happening to his brain and body. Oh dear. This is one of the very best Audible experiences I have had over a number of years. Loved this book! It is so simple, but as you will see, it covers the cutting edge of discoveries and advances in brain plasticity. Recommended for anyone who ever had an unsuspectingly serious bump on the head or knows someone with a traumatic brain injury (concussion). Or someone like myself, wondering about a heredity tendency toward Alzheimer's. This book is written by an extremely intelligent scientist with a great imagination and writing ability--as well as a superb vocabulary. 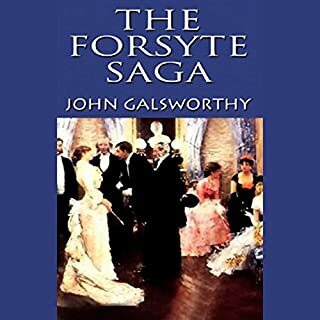 The three novels that make up The Forsyte Saga chronicle the ebbing social power of the commercial upper-middle class Forsyte family through three generations, beginning in Victorian London during the 1880s and ending in the early 1920s. Galsworthy's masterly narrative examines not only their fortunes but also the wider developments within society, particularly the changing position of women. Worth reading/listening to again to fully appreciate the characterizations and Galsworthy's point of view strategies as he moves from third person omniscience among the primary characters to various degrees of omniscience and strictly limited third person narration for most secondary characters. 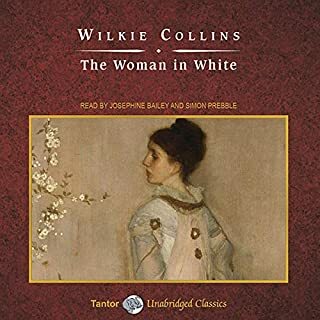 Most interesting is the opaque narration of the primary female protagonist Irene compared to her counterpart first husband whose thoughts Galsworthy so generously shares with us to the end. A true in- depth portrait of an American family and turn-of-the-century era. Would you listen to Bach and the High Baroque again? Why? Absolutely. Not only do I get to enjoy my favorite Bach pieces, but I get to learn about Bach, his background, the baroque era and musical styles and theories. And: with the help of modern technology, I get to listen to this superb course while gardening or performing household chores. I listened first to this course over stereo bluetooth headphones or speakers and that inspired me to order cables to run the sound through my Bose systems so I can listen wherever I am. I have already repeated many sections just because I enjoy the music and the professor's discussion so much that I hate to move on and want the course to last as long as possible. 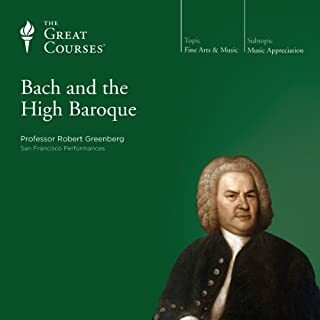 What other book might you compare Bach and the High Baroque to and why? The obvious comparison would be other books in the The Great Courses series, either the broader survey courses or the specific genre courses (symphony, concert, jazz, etc). There are not that many books that offer both music samples as well as discussions about the music, composer, and the background of both. What does Professor Robert Greenberg bring to the story that you wouldn’t experience if you just read the book? His enthusiasm, sense of humor, examples, but most of all, his judicious selection of music samples and detailed discussed of the samples. He is very down to earth and has a very pleasant voice. I thought I had died and gone to heaven within the first few minutes of listening. My favorite music, favorite composer, great sound, and a friendly, intelligent voice to discuss it all. This is the most worthwhile book credit I ever used. I can't wait to proceed with the Great Courses series.